The Prime Minister of Italy, Mr. Giuseppe Conte, visited the Kurdistan Region of Iraq. In a meeting with Prime Minister Nechirvan Barzani, Mr. Conte commended the Kurdistan Regional Government (KRG) for their continued efforts in fighting terrorism and for welcoming a large number of internally displaced persons (IDPs) and refugees. He added that the Kurdistan Region was an example of tolerance and coexistence among different religious and ethnic groups. 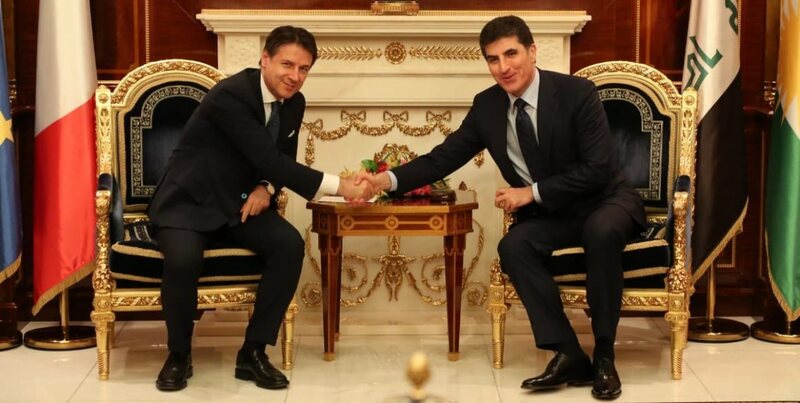 With the respect to bilateral relations between Italy and the Kurdistan Region, the Italian Prime Minister reiterated his country’s willingness to support the Kurdistan Region via humanitarian aid and military co-operation. Prime Minister Barzani thanked his Italian counterpart for the support during the war against ISIS, stressing the importance of the international community’s role in assisting the Kurdistan Region. Moreover, he noted that the threat of terrorism still exists and that the KRG is collaborating with Baghdad to eradicate it completely. In this regard, PM Barzani briefed Mr. Conte on the progress in the relationship between Erbil and the Iraqi Federal Government, reaffirming the KRG’s support to the Iraqi Prime Minister, Adil Abdul-Mahdi. The discussion also focused on the reform process that the KRG administrative system is undergoing, with Prime Minister Barzani pointing out how clear signs of economic recovering are being registered and the consequent opportunities for Italian companies and businesses to invest in the Kurdistan Region.